Because of the pattern and body structure of the tiger, this tattoo can be a little more difficult to work with than other tattoo themes, for the tattooist. One thing I particularly like about the tiger tattoo is what you can do with its stripes. You can use realistic colors, fantastic colors, or use only dark inks. However you do it, it really comes out fantastic, at least for my personal tastes and observations. Tigers of course are able to be presented in the orangish/red colors, which can really look good. But I prefer the darker colors and stripes, which can really stand out boldly and strongly. 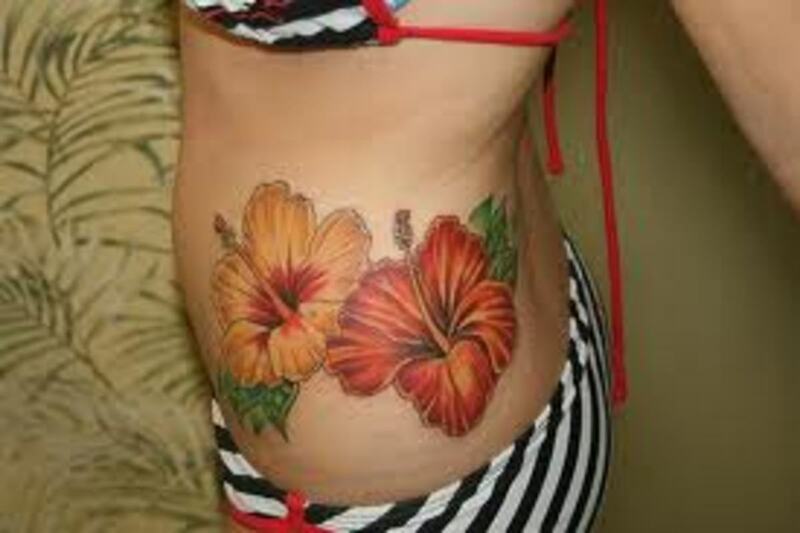 If I were a tattoo artist, I would choose the darker colors and lines and let the others do the orange ones. 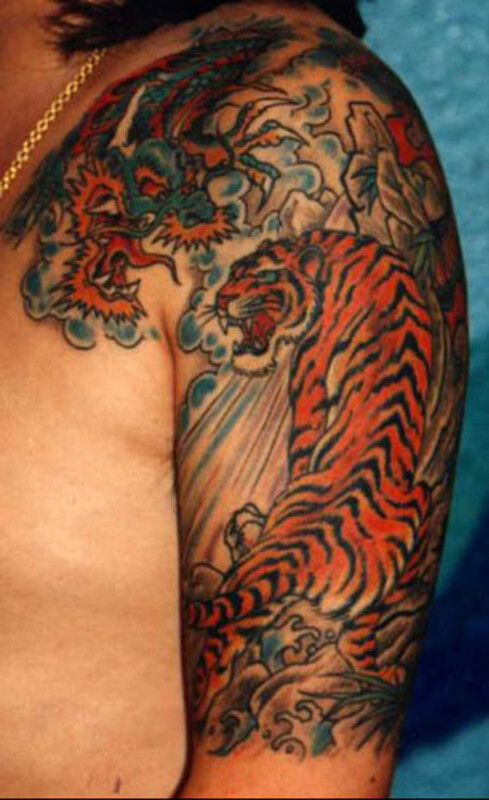 I'd do one that showed the huge tiger claws as a major part of the design, like the photo included in this article. The only thing I didn't like about this one was the tiger's right eye, which lacks fierceness and intensity. Other than that, it's a great tattoo. The inclusion of the tribal features add to the quality of the tattoo as well. 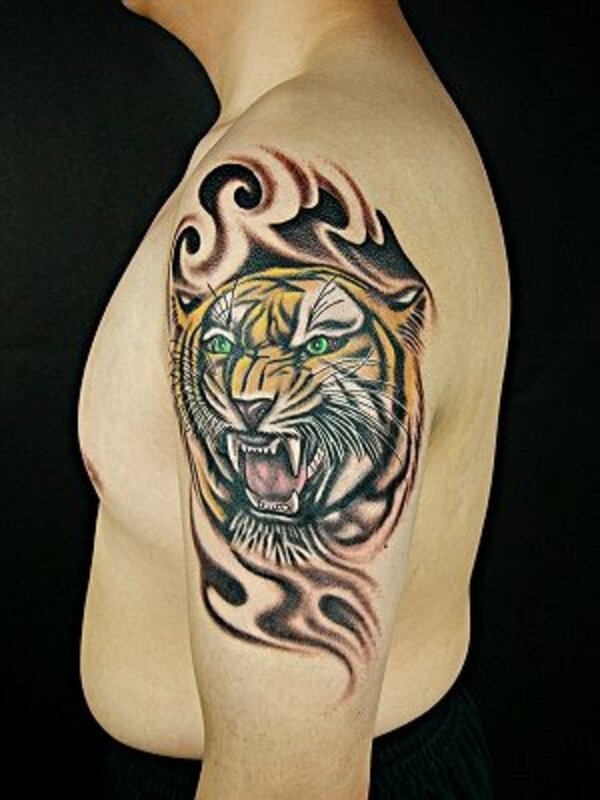 If you're going to have a lot of color in a tiger tattoo, you may as well do it right, as in the image below, with the vibrant orange color of the tiger enhanced by those dark lines. What particularly stands out for me though is the position of the tiger, where it seems to be growling at something behind him as he's turning to walk away. The way his head is turned towards the viewer is a fantastic design. Another thing that could be done to improve the tiger tattoo would be the inclusion of the type of environment it stalks in, but not for the purpose of making the environment look so realistic, but rather shadowy, and again, with dark lines. I could see a tiger with color looking great in this, or the other way around, having the environment colored but the tiger dark and the stripes and claws prevalent. In looking at some of the attempts to put the tiger together with another figure, I also found that didn't really work too well. Those who follow the fung shui way will like the tiger and dragon together, as it would make sense to them in what they represent. But for some reason I just see this creature alone and stalking, and a tiger just doesn't seem to work well with other real or mythical animals. Of course this is my personal preference, and other people may really like it. 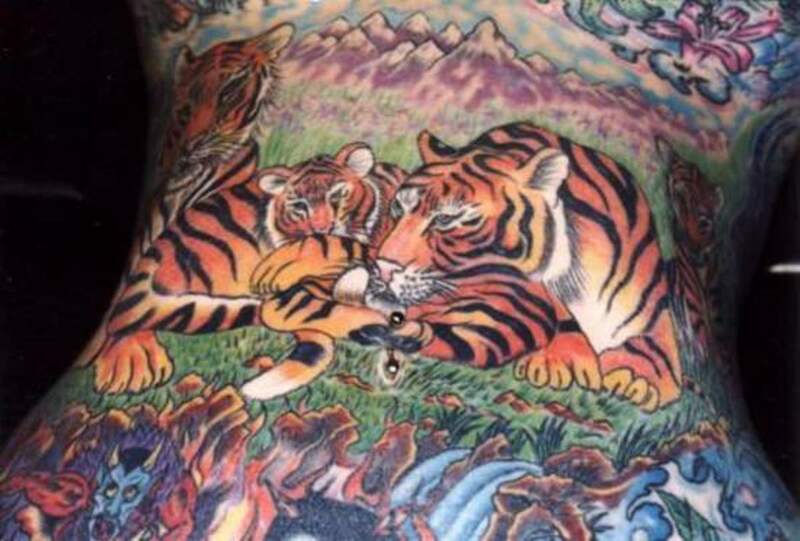 This is a nice tattoo on the neck of a tiger family lying peacefully together. It's not really how must of us think of with the tiger, but it is a nice sentiment, and it works in what it's attempting to convey. The setting and the background is nice, especially those white-capped purple mountains in the background. And if you're wondering where that fourth tiger is located, it's on the right side of the neck and photo. This is a pretty cool image of a tiger appearing to be running right at the one looking at it, wrapped around by some tribal designs. The jungle cat and tribal elements work together very well. I like how the animal is portrayed in a powerful manner, evidenced by the strength of the shoulders and chest, which is done admirably. What's also cool is the tribal design in and of itself, which could have worked terrific as a standalone tattoo. 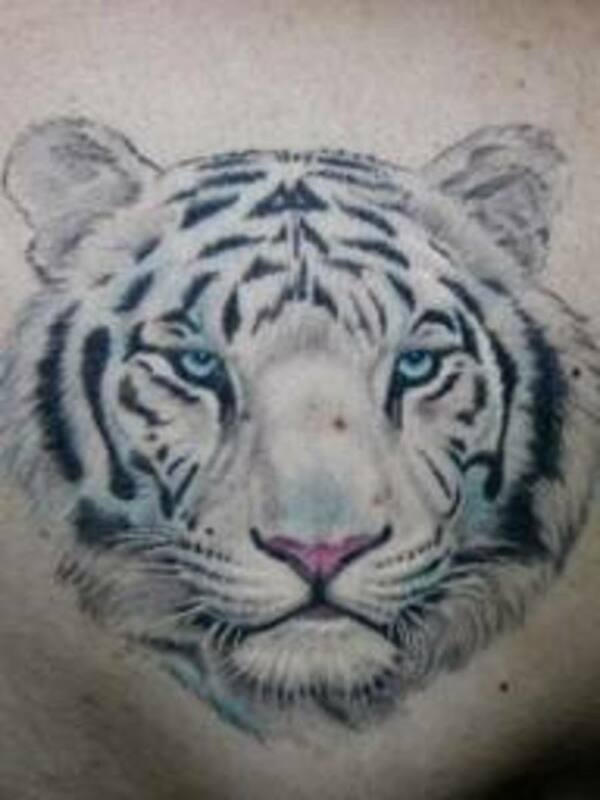 Below are three very high quality tiger tattoos which would have looked good individually or collectively. The dark is is especially attractive, and the quality of the tiger designs very high. I like the way they're all presented in various moments of action. 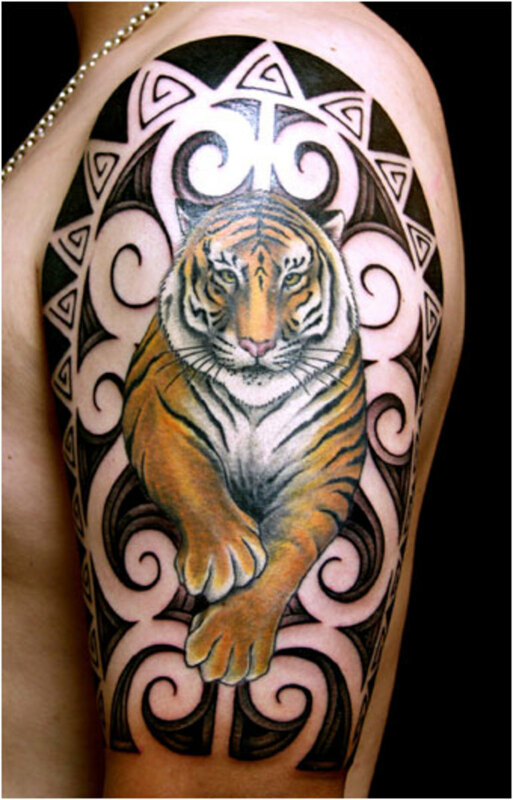 My favorite part of the next tiger tattoo design is the way the body of the tiger is made to wrap around as it prowls. It works because it looks good, but also because it allows those looking at it to see the tiger in its entirety. Some tattoo artists decide to wrap tattoo designs around the parts of the body they're placed on in a manner which doesn't let you see the tattoo unless the person has to turn their body or part of the body it's placed on in order to see the whole image. I've never liked that because it loses much of its impact when you have to do that. Since this particular tiger is prowling and hiding, I can understand the decision to make it look like it's hidden in the bush, it would have look better with some subtle outline around the body of the tiger so it would stick out a little clearer than it does. There is no doubt the guy who has this tiger tattoo on his shaved head is bold, although there's a good chance it's probably a temporary tattoo. But even if it is, you would have had to have done all the preparation to have it placed there in a way that allows it to stay in place. I'm not saying for sure it's a temporary tattoo, just that it's possible it is. Either way though, it's a tattoo design that would garner a lot of attention, as it's virtually impossible not to see these bright colors standing out in plain sight for all to see. Tiger claws make awesome elements for a ripped flesh tattoo as you see below, being designed in a way that puts them right in your face as they appear to rip through the torn skin of the bearer of the tattoo. 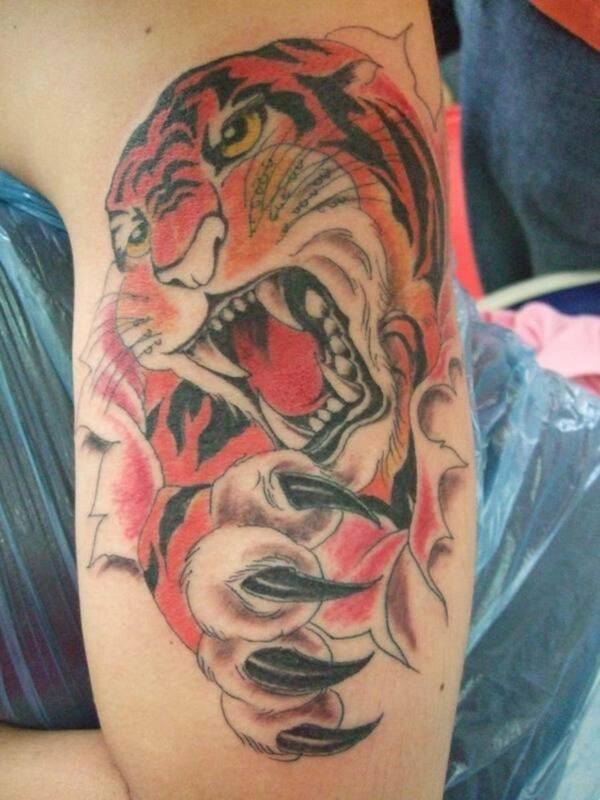 The concept for this tattoo was a very good one, but what isn't real attractive is the colors chosen for the tiger, which make it look far too cartoonish for the theme being displayed. Darker ink would have been much better, or at least the color on the flesh of the skin left out, or looking much more realistic in what was supposed to look like blood. If you're going to get this type of tattoo, it needs to be taken all the way for it to work. To me this is easily the best tiger tattoo of the bunch, although that is slightly prejudiced by my preference for dark ink on the majority of tattoo designs. But the tiger is especially made for this type of look, as you can see in the photo. Not only is the design very compelling, but the placement was perfect for the image of the tiger, which appears to be crawling down the arm in search of prey. Very nice. 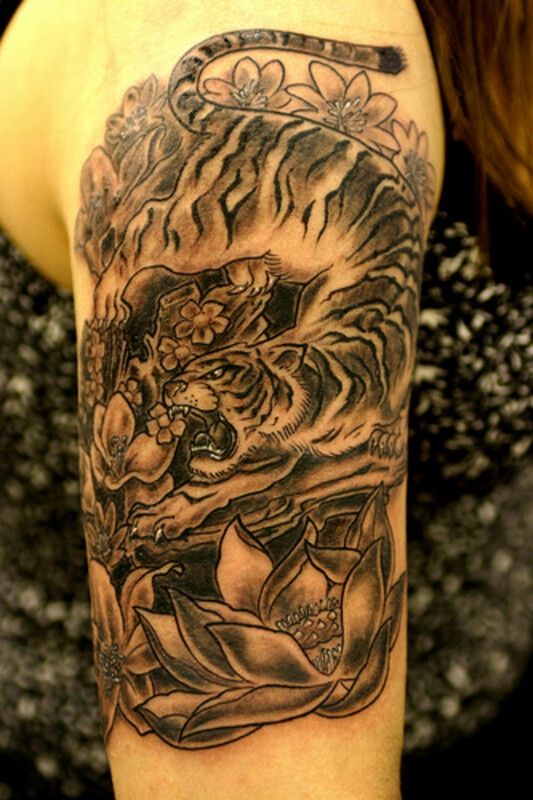 This tiger tattoo pic below was one of my favorites, because of the way the artist kept all the lines dark, and adding or shaping the moon in the background gives a great effect. Another part of what made it good was the small, detailed jungle trees and foliage which add to the overall strength of the tattoo. 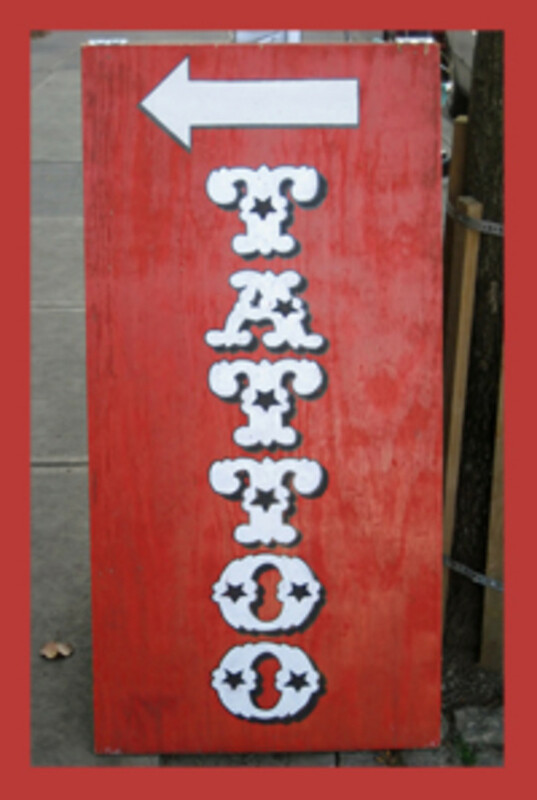 This, even if on a smaller level, should be what tattoo artists look for for their clients. Obviously it's up to the client, but this is awesome to me for a tiger, and looks much better than the tiger body or head with nothing else around it. So there's my take on tiger tattoos. They're more difficult and challenging to make, not only because of the many intricate details which make a tiger what it is, but also because of the difficulty in adding things the really enhance that tattoos. It's hard to explain, but you know it when you see it. 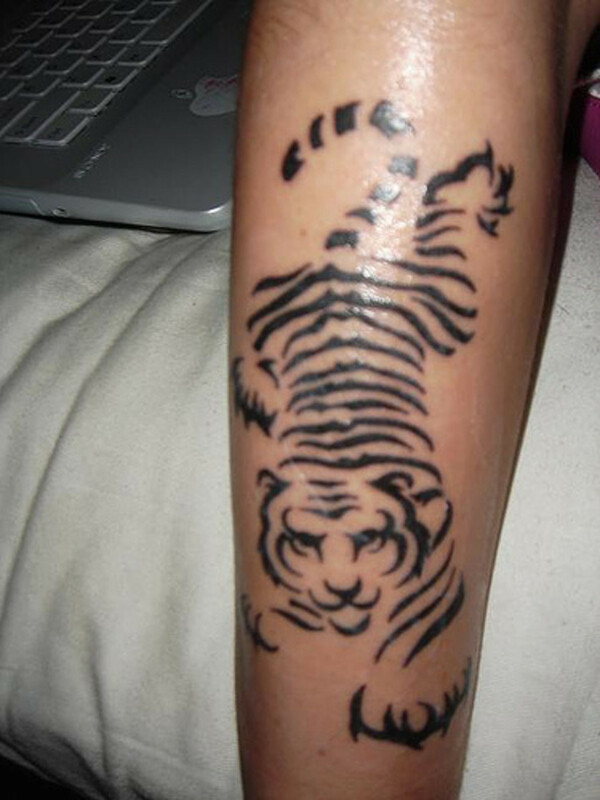 Tiger tattoo designs have tremendous potential, but overall I would go with one that has darker ink than one attempting to reproduce the giant cat in all its realistic color, as they don't seem to translate as well to the skin as darker ink does. 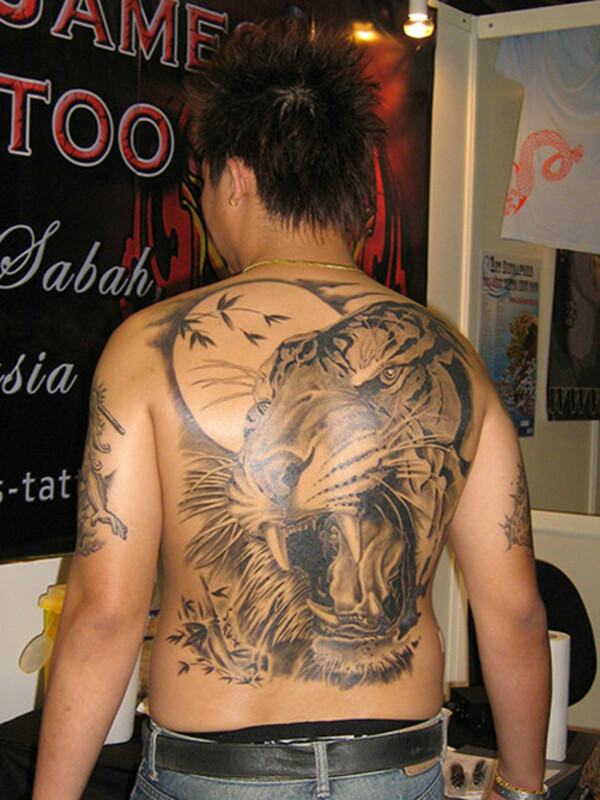 I want to get tatto on my back with tiger. I need to know the pricing. Thanks for the kind comment on my tiger backpiece work! It is a wonderful crawling panther tattoo, in black, on the left shoulder. It is really impressive, and this shows the wild side of human nature to free from all oppressions and rules.